There are four verb constructions which require agreement with the subject. Agreement is always required between the subject and past participle in the passive voice, in all tenses and moods. La machine est réparée par mon frère. The machine is repaired by my brother. Les voleurs étaient recherchés par la police. The thieves were wanted by the police. Cette idée serait appréciée de tout le monde. This idea would be appreciated by everyone. 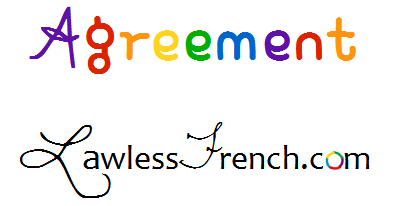 Agreement is required with all compound verb tenses and moods (e.g., passé composé, conditional perfect) when the auxiliary verb is être. Nous y sommes allés ensemble. We went together. Elle était rentrée à midi. She had come home at midnight. Ils seraient tombés. They would have fallen. When the auxiliary verb is avoir, there is no agreement with the subject. * There may, however, be agreement with the direct object. * Except with verbs of perception. Agreement is required with pronominal verbs in compound tenses and moods when the reflexive pronoun is a direct object; when it’s an indirect object, there is no agreement – learn more. Even though they’re conjugated with avoir, verbs of perception also require agreement with their subjects.